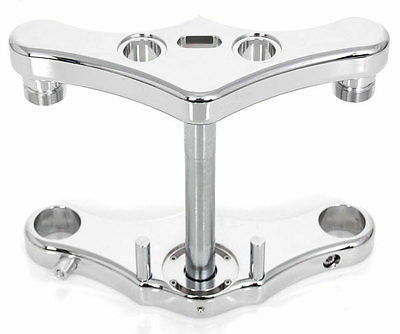 Custom chopper forks are something that you need to decide upon before you build your bike, in my opinion. You could build the frame and then decide, but that's up to you. However, how the forks are attached are important to the rake and trail of your bike. In theory all forks require a part called a triple tree to allow your bike to steer. If you want a raked out look there are a few ways you can accomplish this. One way is to buy raked triple trees. 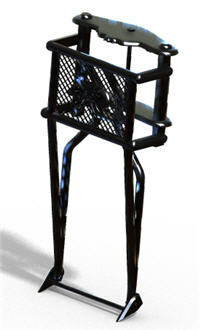 This is probably the easiest way to accomplish a raked look and feel, other than modifying the frame. When you buy forks you need to consult with the fork manufacturer (builder) about the type of frame you are putting them on because, for example, if you have a frame that has a rake of about thirty three degrees or longer you'll need to have custom made forks to fit the frame. You also need to tell them what the wheel size you are going to use is going to be. Many of the fork front ends on the market are built for a shorter rake (upright), so when you try to put them on your frame which is more laid back than the fork is designed for, it won't work right, and will cause stress to your chassis which is very dangerous. So be sure you work all this out with both the frame builder and the fork manufacturer. An example of this would be where the forks flex at a right angle to the motion of the shock. In other words the forks flex incorrectly. 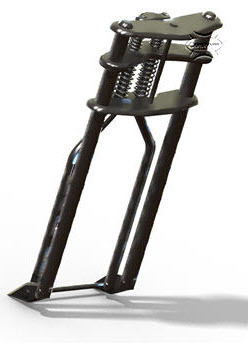 Custom chopper forks mainly come in three types of designs. Hydraulic, Girder, and Springers. Hydraulic forks are very popular because they are relatively low cost for the most part, and there are many used and aftermarket ones available. Hydraulic forks are on most of the factory made motorcycles. They are also more difficult to custom build for the average builder at home. 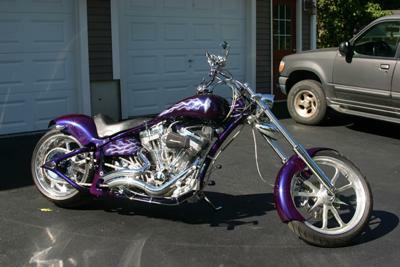 However, if you want a more modern look to your chopper then you will probably be looking to get hydraulic forks. A hydraulic fork has everything all hidden inside the tube: the spring and shock. And hydraulic forks are often inverted. Inverted forks means that the lower part of the fork goes into the upper section of the forks. The reason for this inversion on hydraulic forks is because the stresses put on the forks when angles are taken by the motorcycle are handled more efficiently with this design. For example, a hydraulic fork that is not designed properly and is standard, may will end up jamming the upper fork tubes which is exceptionally hazardous. Girder forks are not as popular as the hydraulic or springer designs. But they are not extinct either. They were basically the first type of fork created for motorcycles way back before World War II. The British motorcycle manufacturers used the girder design for most of their bikes back in the day. The term 'Girder' originated from the actual design which is basically a girders with springs attached to them in a squared shape which was on the neck of the motorcycle. Girder forks still have fans and they fit the old vintage style very nicely. You can build girder forks, and they can really ad a cool vintage feel to your bike. Many builders believe that girder forks are best for raked out choppers because they handle it better than hydraulic forks. 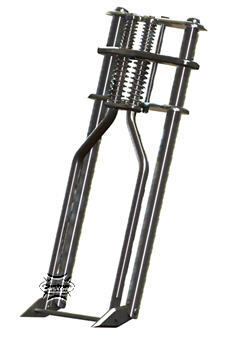 Springer custom chopper forks are probably the most popular for the old school designers and riders. They truly look cool, even on modern looking bikes. They are called springers because they have 1 or 2 large springs at the neck, and they are prominent features. There is another distinguishing feature which is the hinge type assembly at the bottom of the forks (where the wheel attaches). The fact is, you'll need decide what you want your forks to accomplish other than holding your front wheel. For starters, you'll want to know what the right length of the forks needs to be for your motorcycle. So what you can do is take a measurement of the area where your forks will need to fit. One way to do this is to put your frame up to the height you'll be riding it at. You can do this any number of ways but a simple way is to put blocks underneath the frame after install the rear wheel. Height of the neck tubes.